For the first step, barley is mixed with water during 3 days and left for 12 more days to undergo germination. At this point starch turns into sugar; germination is stopped by drying the malt, sometimes over a peated fire, during 3 days. The malt, left aside for 2 months, is ground into a very fine powder. 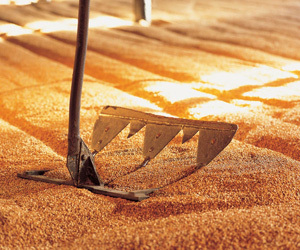 Ten tons of malted barley is mashed with 3 different waters, each time at a different temperature: 68°, then 75°, then 85° to 90° for six hours. This operation results in a very sweet liquid called “wort” that should give approximately 4000 litres of whisky. Wort is then cooled down to 17°. Fermentation is being carried out during 3 days in a washback of a total capacity of 50 to 60 000L, traditionally made in Oregon pine (US) and lasting approximately 20 years. The mash tun is filled with wort and added yeast and fermentation begins. Yeast turns sugar into alcohol and carbon dioxide. Wort contains 7 to 8° alcohol ABV (same as a beer), and is kept at a temperature of 33°C. The first distillation is done in a big still of 9500 litres and lasts for 5 to 6 hours. At this point the liquid called “low wines” contains about 25°ABV. A still may last up to 10 years. 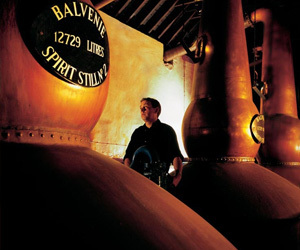 The second distillation is done in a smaller still, called “Spirit Still” during 8 to 9 hours. The alcohols produced are split into three: “foreshots”, which are very high in alcohol, the heart, containing usually 65 to 70° alcohol and alcohols from the end called “feints”, with a concentration too low in alcohol. Foreshots and feints will undergo a second distillation, as nothing goes to waste! Heart alcohol is reduced to 63° for oak cask maturation. Ageing is done in a warehouse containing millions of litres of 63° alcohol. 2 main types of casks are used: Bourbon oak barrels (US), of a 170 to 190 litres capacity, giving strong and powerful whiskies and Sherry oak casks (Spain), of a 500 litres capacity giving the whisky its colour and smoothness. 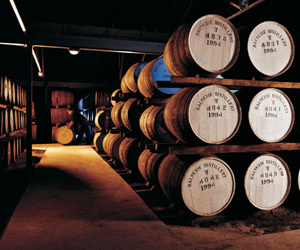 Blending, maturing and finish are usually made in port, rum or French wine casks, and last 6 months to 2 years. Air and dampness of the cellar are naturally regulated. There are few variations of the product from one season to another. Each year 1 to 2% of the product evaporates, the so-called “Angels’ share”. Before bottling, alcohol concentration is reduced to its commercial strength (minimum 40°) by adding water. 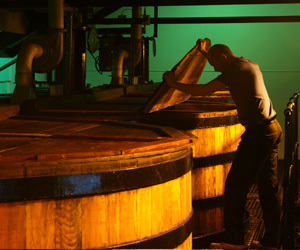 The whisky is then chill-filtered (or not) to remove residues before bottling.